The init program is responsible for starting up all the system processes configured in the /etc/rc.d directory and its subdirectories. Until this point, the boot process is pretty much the same in all the different Linux distributions. The init program configuration is also conceptually the same, but the structure of /etc/rc.d directory and its contents may have slight differences among the different Linux distributions. To keep the discussion simple, the init program configuration is discussed for two popular Linux distributions, Red Hat and SuSE, as outlined in the first chapter. It is important to keep in mind that the init program is a process initiator, and hence for the system processes to run successfully, the basic system should be up and running with its root file system, which is ensured by the kernel before it kicks off the init program. Figure 2.4 displays the sequence of events that take place while booting a computer that has both Windows and Linux installed. 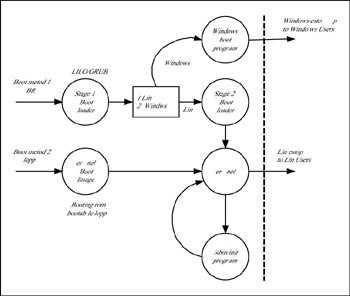 Figure 2.4: Booting events in a dual boot configuration of Linux and Windows. The init program interacts with several scripts located mainly in the /etc/rc.d directory and its subdirectories. The /etc/rc.d directory contains a set of subdirectories and scripts designed to enable the init program to start up the Linux system with different configurations. The directories are named rc0, rc1, rc2, rc3, rc4, rc5, rc6 and init.d. In addition, there are initiation scripts such as rc, rc.sysinit, and rc.local. Each of the files in the /etc/rc.d/init.d directory is an executable script and usually accepts a simple parameter such as start, stop, status, restart, and reload. Each of the directories named rcN (where N takes value 0 through 6) represents a specific run level that the system is booted to, and contains links to a subset of scripts from the /etc/rc.d/init.d directory to be executed at that run level. The links established in these directories start with K or S followed by a two-digit integer and the name of the script for which the link is established. The letter K indicates that the process identified by the link should be killed (or stopped), and the letter S indicates that the process should be started. The two-digit integer indicates the sequence in which the script must be executed (either for starting or for stopping), 00 being the highest priority and 99 being the lowest priority. Listing 2.1 displays a typical list of the links defined in run level 5 of a Red Hat Linux 8.0/9.0 system. In Red Hat Linux, the init program first runs the /etc/rc.d/rc.sysinit script as the first startup script and begins the initiation process. The main purpose of this script is to set the environment path, checking whether the system was properly shut down in the previous session (and hence checking file system integrity), loading the default keyboard, and initializing the system clock and so on. The next step performed by the init program is to start/stop the processes based on the settings in the /etc/inittab file. Based on the run level the system is booting at a particular time, the init program starts the processes defined for that run level (and kills the processes that should not run in that run level). The /etc/rc.d/rc script is generic and is used to start processes in any run level. The script takes a parameter that identifies the run level. Finally, the init program executes the rc.local script, thus permitting your own customized initiation tasks tailored for your system. As mentioned earlier, conceptually the init program performs the same job without regard to the specific distribution of Linux. There may be minor differences in the directory structures and the contents across the different distributions. For example, in SuSE Linux 8.1 and 8.2, the set of rcN (N ranging from 0 through 6) directories are subdirectories within /etc/init.d directory. In fact the /etc/rc.d directory is a link to /etc/init.d directory. The /etc/inittab file and its configuration entries are very much similar to those in Red Hat Linux. The /etc/init.d/boot script is first executed by init, which in turn executes the /etc/init.d/boot.local script in order to provide an opportunity to the user-preferred tasks before entering a particular run level. Therefore, if you desire to run any specific scripts or services before entering a specific run level, you could define them in the boot.local script. By default, this script is created without any contents. Next, the /etc/init.d/boot script executes services as defined in the /etc/init.d/boot.d directory. After the successful execution of /etc/init.d/boot script, the init program executes the services defined for the particular run level, in a way very similar to Red Hat Linux. As you have noticed here, each distribution has its own way of executing the system initiation processes, and the product manuals of the respective distributions should be consulted for more details. Also, a specific vendor usually tries to keep the system booting and process initiation uniform across successive releases, although at times some changes might be introduced in order to improve the overall process. Therefore, the process discussed in this section might also be applicable to the earlier releases of the respective vendors.